Best Monitor for GTX 1080 - Which Monitor is Best for You? 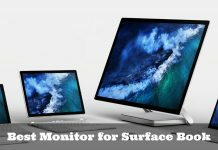 Home Monitors Best Monitor for GTX 1080 – Which Monitor is Best for You? If you have upgraded your PC with the NVIDIA GeForce GTX 1080 Graphic Card or going to get it soon, then this post is for you. We are now going towards the end of the year soon. And as the new technology gets an introduction to the world, the list of best-rated products changes from time to time. But, there are some products which are such high-quality that you can pick them at any time and for any reason. Today, we are going to see such amazing products, i.e., monitors which can be proved significant for the NVIDIA GTX 1080 Graphics Card. All the displays I am going to review in this article are highly rated and tested to work with the G-Sync technology. Is GTX 1080 Monitor important? Without any doubt, the GTX 1080 is one of the most prominent graphics cards of the year. It is faster than the GTX 980Ti for almost 35%. It is 4K capable, can be overclocked easily, 3D screenshot compatible, and top of all, VR games can be played at a new level while you have it in your system. So, if you are a real gamer or high-end graphics designer or even a computer nerd who want a top performing system at the moment, then you should go for the GTX 1080 card. But wait, getting this powerful new generation graphics is not enough, you should also have a compatible specification like resolution and screen size to get the best performance from it. 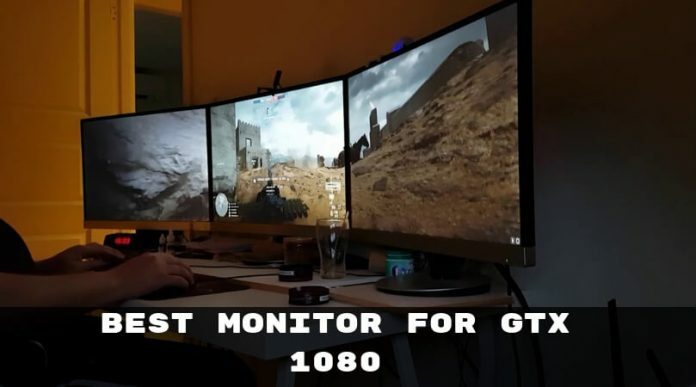 And thus, it is quite essential to have a supportive GTX 1080 monitor on your desk. With the support of the NVIDIA G-Sync dynamic refresh rate and decent response time, the Dell S2417DG is the best gaming monitor for those who want a mediate sized monitor at a budget rate. Its low input lag and rapid responsiveness will help you to stay ahead of your competitors. It offers Quad HD resolution of 2560 x 1440 pixels on its 24-inch screen. This screen offers a rapid response time of 1ms with an excellent refresh rate of 165 Hz. According to the gaming level, you can preset the modes of the game to enhance the viewing experience. It has viewing angles of 170° horizontal and 160° vertical. The TN panel display has an expect ratio of 16:9. It is available in 24” and 27” sizes, so you can select the appropriate screen for you. Due to the flicker-free technology, you can swap the systems according to your gaming. It has HDMI, DisplayPort, USB ports as the connectivity options. It is compatible with all the Operating Systems, so no worry for the OS support. If you want to save your desk space, then you can buy the additional single arm or dual arm mount with the display. 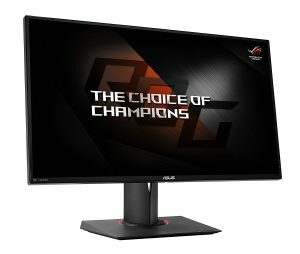 The Rog Swift PG278QR from ASUS is one of the initial 144Hz monitors introduced in the market. Apart from the stunning refresh rate and overclocking capability, it has multiple connectivity options to support compatible devices. This monitor has a 27-inch screen size on which it supports the maximum resolution of 2560 x 1440 pixels (1440P display). It provides 1ms (GTG) response time and 165Hz refresh rate for overclocking. You will get multiple connectivity options with HDMI, DisplayPort, and USB 3.0 ports. With the blue-light filter, flicker-free backlighting, and Eye Care technology from ASUS help to reduce the eyestrain and to provide enhanced visual experience. The ergonomic stand provides an option for swivel, pivot, tilt, and height adjustments to allow you to play in your comfortable position. It has a contrast ratio of 1000:1 with a horizontal 170-degree viewing angle. It is available in four different sizes and seven different styles. The ASUS Rog Swift PG278QR reviews suggest that it is one of the best displays with the NVIDIA G-Sync technology for smoother gameplay without screen tearing and stuttering problems. You will get three years of warranty from the company. 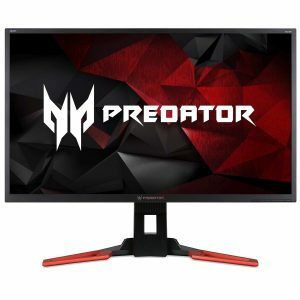 From the backbone of the Predator line, the Acer introduced a distinct, 4K capable, and G-Sync enabled gamer display edition with the XB321HK. For the NVIDIA GTX 1080 graphic card, this is the perfect monitor to have on your desk. Its 32-inch IPS screen will surely enhance your gaming experience. It is an ideal size to enjoy the multimedia content at a full native resolution. It supports an Ultra HD maximum resolution of 3840 x 2160 pixels (4K) on its 32” screen. It has a 60Hz refresh rate (overclockable) and 4ms of response time (Grey To Grey) on the IPS panel display. You can choose your favorite display from the six sizes and six different styles available from the company. This monitor has one DisplayPort, one HDMI port, and four USB 3.0 ports for the connectivity. It has two built-in speakers with the 2W output on each of them. The NVIDIA GSync technology with the flicker-less feature gives you stunning visuals and reduces the eyestrain by eliminating the screen flickering. It has a brightness of 350 cd/m2 and a tilt angle of -5° to 25°. You can rotate the screen up to 90 degrees. The EchoDisplay technology from Acer will help you to reduce the power consumption by almost 60%. With the attractive design and easy-to-use controls, the LG 34UC89G-B is a strong contender of being the best monitor for GTX 1080 card. It has an incredible HDR capability to provide you with stunning visuals on the curved screen while you play games or stream multimedia contents. The IPS panel has an aspect ratio of 21:9 with a 0.31-pixel pitch (mm) and 99% sRGB color reproductivity. It has a 5ms response time along with a 144Hz variable refresh rate. The ‘crosshair’ feature with black stabilizer on a dedicated game mode will help you to enjoy the most advanced gaming at ease. The NVIDIA GSync technology will eliminate the screen tearing and provide the faster and smoother playing experience. It has one HDMI port, one DisplayPort, one USB 3.0 in port, two USB 3.0 out ports, and one headphone jack for the connectivity. 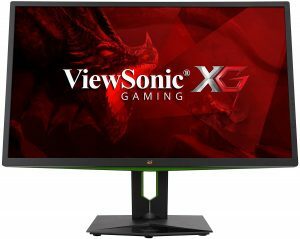 The ViewSonic XG2703-GS is a flagship monitor of the company in its 27-inch lineup gaming displays. With the GSync adaptive refresh rate and immense refresh rate of 165Hz, it will provide an incredible gaming experience to the user. 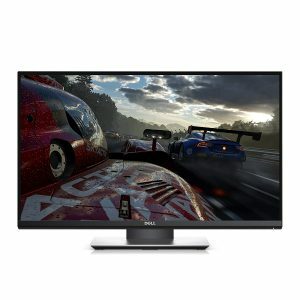 If you are looking for an affordable monitor for the NVIDIA GTX 1080, then you can go for the XG2703-GS gaming display. It has a 27” widescreen on which you will get a maximum resolution of 2560 x 1440 pixels (1440P). The monitor has a 4 ms (GTG) response time and 165Hz refresh rate which provide stunning visuals. For the connectivity, it has one HDMI port, one DisplayPort, one USB 2.0 Type B, two USB 2.0 Type A, and two USB 3.0 Type A ports. It has two built-in speakers with 2W output on each of them and a 3.5mm audio jack. With the help of NVIDIA GSync technology, you will have smoother image visuals and reduced eye strain. The display comes with a fully-adjustable ergonomic stand and a blue-light filter to provide you comfort while playing games for the longer time. The company provides the industry-leading three years of warranty for the product. 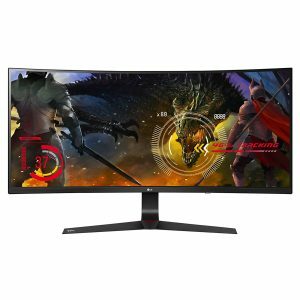 Which monitor is best for GTX 1080? 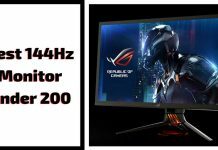 Well, if you have seen the above-listed monitors in detail, then you may have noticed that they have the specifications like 144Hz or above refresh rate and/or resolution of 1440P. Yes, you got the answer. As per the testing was done on the single GTX 1080 graphics on the 144Hz monitors, the display with such specification is suitable for your gaming needs. 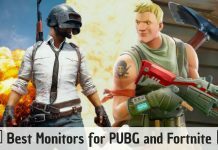 There is a lot of products in the high-end market of gaming monitors, and the choices mostly prefer to go for the Acer, ASUS, Dell, or LG displays. But, you can also go for the options like View Sonic if you are looking for an affordable solution for your high-end NVIDIA GTX 1080 needs. Let me know your favorite GTX 1080 monitor from the list above. If you are using any other display that is providing a competitive performance, then also you can share your thoughts here.